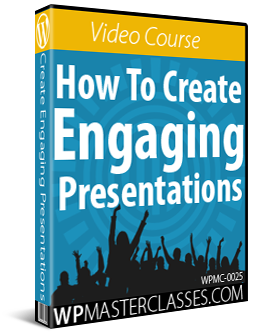 This tutorial was created using an earlier version of this WordPress plugin. To be notified of content updates, subscribe to our updates list (see sidebar), or Like our Facebook page. As an online marketing tool, WordPress is probably the best platform available for publishing search engine optimized content and getting your site indexed quickly in search engines like Google. WordPress not only offers a number of powerful search engine-friendly features such as the ability to configure permalinks, notify update services and add an xml sitemap, but you can also use SEO plugins that will boost your site’s performance in the search engines even further. 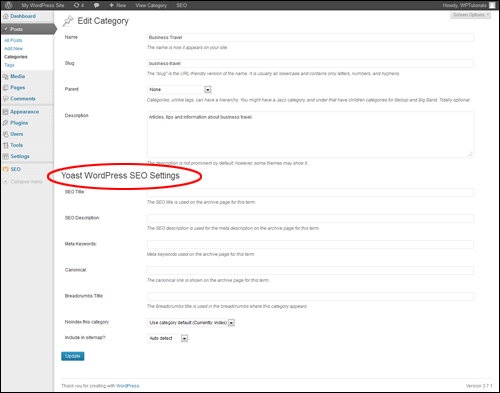 In this tutorial, you are going to learn how to install, configure and use Yoast SEO, a powerful SEO plugin that offers you a complete WordPress SEO configuration package. Yoast SEO is a powerful, comprehensive and fully-configurable plugin with professional-level SEO capabilities. WordPress is a very good platform for SEO, and the Yoast SEO plugin can help you maximize your SEO benefits. If you would prefer to use a simpler, less technical and more automated SEO plugin that does not require configuring as many settings, then consider using the All-In-One SEO Pack plugin or a similar plugin instead. 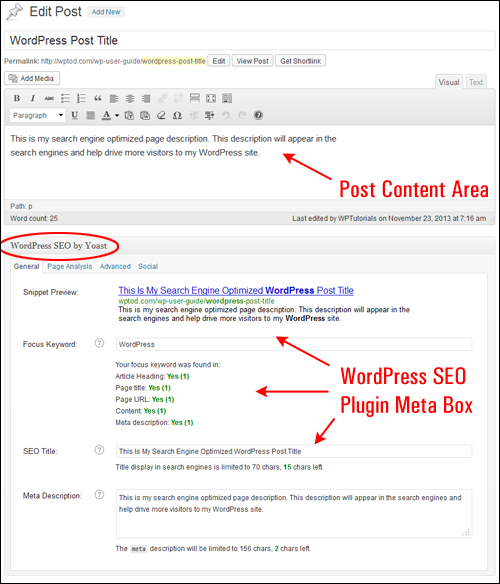 Yoast SEO (formerly WordPress SEO by Yoast) is a free SEO plugin for WordPress, and one of the most comprehensive WordPress SEO plugins available. 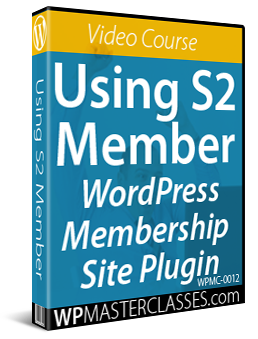 This WordPress SEO plugin is an important component of the WordPress SEO & Traffic strategies described in many of our tutorials. Yoast SEO was written from the ground up by WordPress SEO consultant and WordPress developer Joost de Valk to improve your site’s SEO on all needed aspects. By configuring this plugin as shown in this tutorial, you will be helping to optimize key areas of your site and drive significantly more targeted visitors to your site with organic (i.e. “Free”) search engine traffic. Posting search engine optimized content on your site. While the Yoast SEO plugin goes the extra mile to take care of all the technical aspects of optimizing your site for search engines, it first and foremost helps you write better content. Yoast SEO forces you to choose a focus keyword when you’re writing your posts, and then helps to make sure that you get the maximum benefit from your chosen keyword. If you are currently using an SEO plugin like All-In-One SEO or another similar SEO plugin, Yoast SEO can import all of your existing metadata (i.e. post titles, descriptions, keywords, etc …). 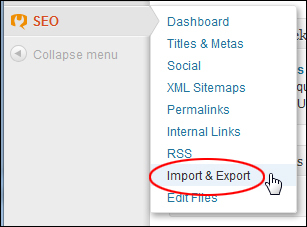 See the ‘Importing Data From Other SEO Plugins’ section at the end of this tutorial. Yoast SEO is continually being updated. As new plugin updates are released, some of the plugin’s settings and features described in this tutorial may look different in the plugin version that you have downloaded. Additionally, when new features get added, some of the plugin’s built-in functions may replace other plugins recommended in these tutorials. For example, Yoast SEO now includes its own built-in Sitemap and RSS feed configurations that previously required other plugins to be installed. Make sure you remain subscribed to receive our updates, so we can notify you when updates to plugin tutorials are made. If you feel that your site requires specific settings to be configured differently than the ones recommended in this tutorial, then we suggest you visit the plugin developer’s website and read through their own documentation and tutorials. Note: If you are installing Yoast SEO to help improve your site’s performance in the search engines, then it doesn’t really make much sense to try and do things that prevent search engines from being able to access your site. Unless you have a specific reason to block access to search engines, therefore, follow the warning’s recommendation and change your settings. Now that you have installed the Yoast SEO plugin, let’s begin to configure it. The information below was created using an earlier version of the plugin. Many of the settings and options shown in the sections below remain the same, but some will have been removed or updated and improved. 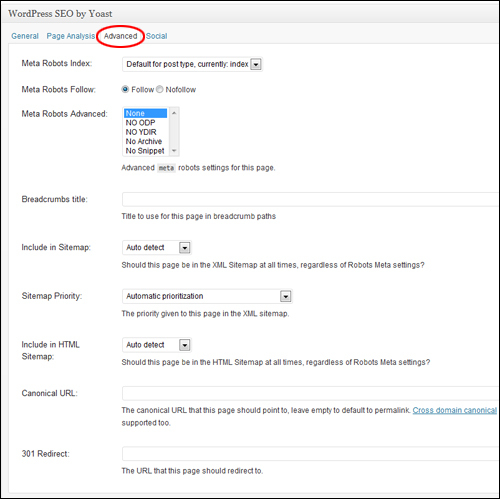 This section includes an “introduction tour” to the plugin, and the option to restore your site to the default Yoast SEO plugin settings. Configure the settings in this section according to your needs and preferences. 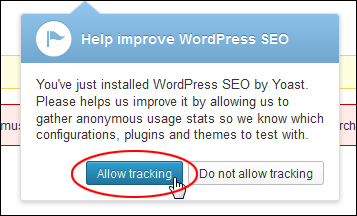 Tick or untick the checkbox in this section to allow Yoast SEO to collect usage data about the plugin anonymously. Yoast SEO provides a convenient method of adding site verification code for search engines that does not require you to edit your theme templates or upload files to your server. Note: To obtain the site verification codes required for the ‘Webmaster Tools’ section, you will first need to set up a Webmaster Account for Google and Bing search (see links below). Alexa monitors millions of websites worldwide and provides information about websites including Top Sites, Internet Traffic Stats and Metrics, Related Links, Online Reviews Contact Information and Search Analytics for SEM and SEO optimization. After adding the verification code to the ‘Webmaster Tools’ section, it’s time to configure the next section of the plugin. After configuring the General Settings section, the next step is to configure the ‘Titles & Metas’ section. This section allows you to specify all of your site’s title templates and meta data descriptions. Don’t worry if you don’t understand what all of this means – just follow the tutorial below to configure this section, and refer to the plugin’s website if you want more detailed information about the settings and features in this section. Basically, this is where you set the templates for your titles and descriptions for all the different types of pages on your site, such as your homepage, posts & pages (under post types), category or tag archives (under taxonomy archives), or even custom post type archives and custom posts. Everything is done from here. 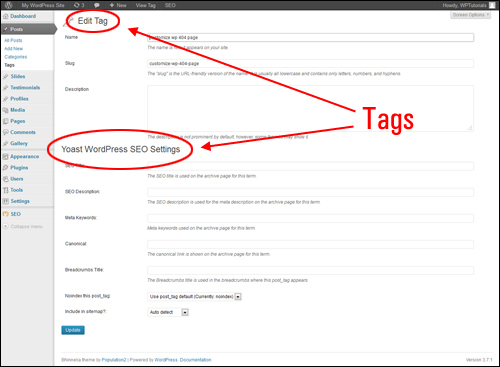 The first thing you need to do is to make sure that the Yoast SEO plugin can change the title tag of your installed theme so that it can modify it as per your settings. The plugin will auto-detect whether it needs to force-rewrite the titles for your pages and enable or disable the ‘Force rewrite titles’ option for you automatically. Noindex subpages of archives – If you enable this setting, any pages belonging to your site archives below the first page (e.g. page 2) will not show up in the search results. 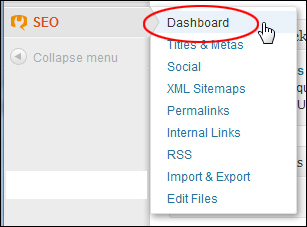 We recommend checking this option, however, as it will help your homepage to retain its importance. 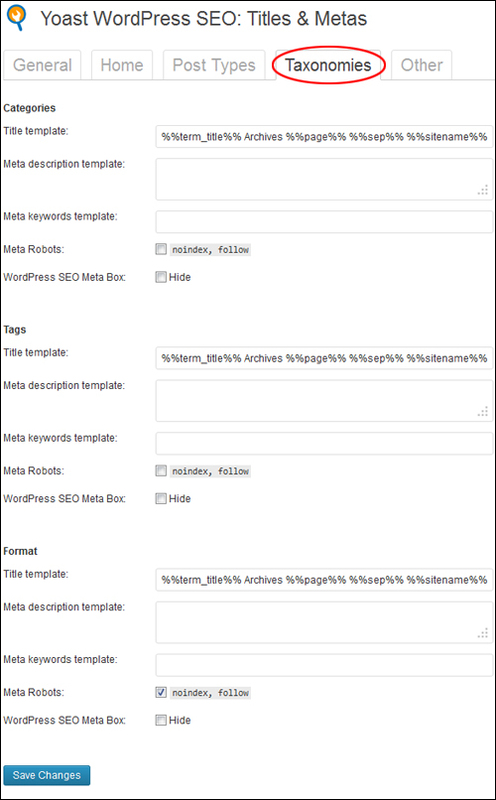 Add noodp meta robots tag sitewide – This option prevents search engines from using the DMOZ description for pages from your site in the search results. Unless your site is listed in DMOZ (the Open Directory Project), enabling/disabling this option will probably make no difference to your results. Add noydir meta robots tag sitewide – Prevents search engines from using the Yahoo! directory description for pages from this site in the search results. Unless your site is listed in the Yahoo! Directory, enabling/disabling this option will probably make no difference to your results. By default, a lot of stuff gets added to your site’s head section that might not be necessary for every WordPress site owner. Unless you are using remote editors or Windows Live Writer, you can hide RSD links and WLW Manifest links. Hide RSD Links – Check this box unless you or other people on your site use remote editors. 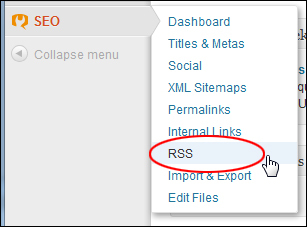 Hide RSS Links – Leave this option unchecked. 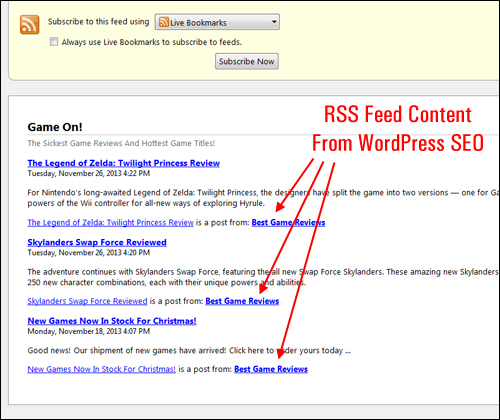 In other tutorials, we show you how to promote your site using RSS feeds with this option unchecked. 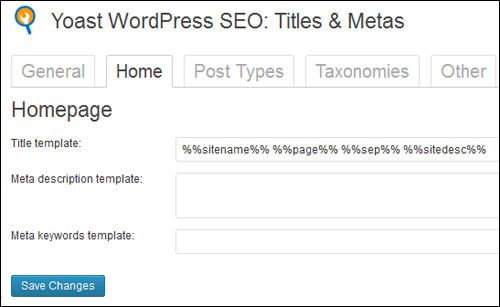 Yoast SEO plugin lets you use variables when constructing meta data templates. 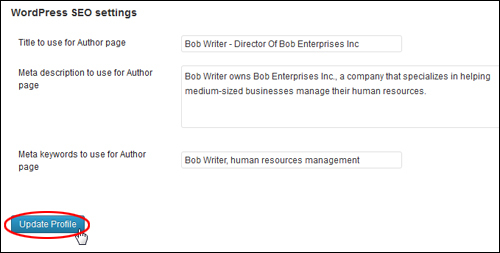 Variables are tags that get replaced with content you have entered into other fields. We cover the Yoast SEO variables used in the plugin settings further below. This section will show different configuration options depending on whether you have specified a fixed home page for your site, or are using your latest posts as your home page. If you leave all fields blank in this section and WordPress is using the default Reading Settings (latest posts display as your home page), then the only metadata that will display for your home page will be the site name and tagline specified in your site’s General Settings. 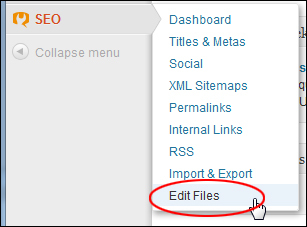 This section lets you configure default on-page SEO elements for your posts, pages, media files, custom post formats, and post format archives. %%sitename%% – Your site’s name. %%sitedesc%% – Your site’s description. %%title%% – The title of your post/page. %%excerpt%% – Post/page excerpt (or auto-generated if no excerpt exists). %%focuskw%% – Your post’s main keyword. %%tag_description%% – Current tag description(s). %%category_description%% – Post category description(s). In this section, you are being asked to define the structure you want for how title templates will display for your site’s posts, pages, and attachments. The difference between a “title” and a “title template” is that a “title template” specifies how your “title” will look. For example, in the previous section, we suggested specifying a fixed (i.e. unchanging) title template, description, and keywords for your home page. For your posts and pages, however, since each post and page title will be different, you will need to define how your post and pages title and other meta information will be pulled, organized and displayed to search engines and user browsers. This is done using a title template. 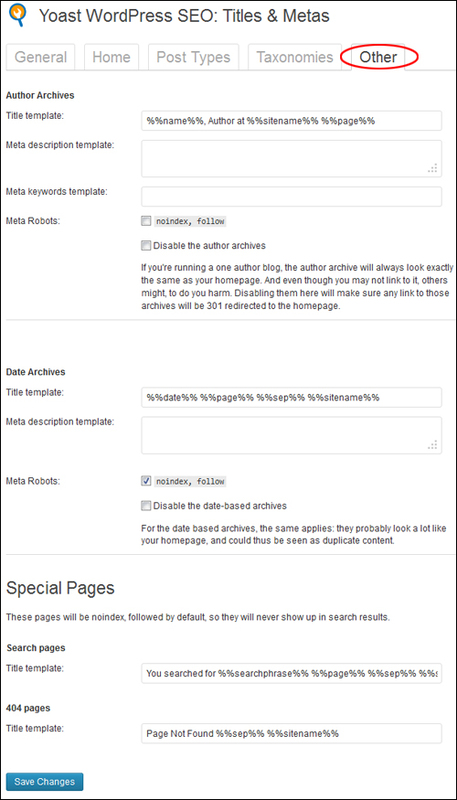 Meta Robots: Enabling this section will prevent search engines from indexing your content. Authorship: Enabling this link will prevent Google from displaying authorship of your content. If your theme supports the date tag then Google may choose to include it in its search results. Some of the settings in this section are specifically aimed at helping you avoid duplicate content in the search engines, by specifying which parts of your site you don’t want the search engines to index (called “noindex”). Also, as stated in the plugin notes, if you own a one-person site (e.g. a single-author blog), then it is recommended that you set certain pages like author archives and date-based archives to “noindex”, because those pages will contain exactly the same content as your main blog page. You can still have date-based archives made available to help your site users find your content, they just don’t need to be indexed. 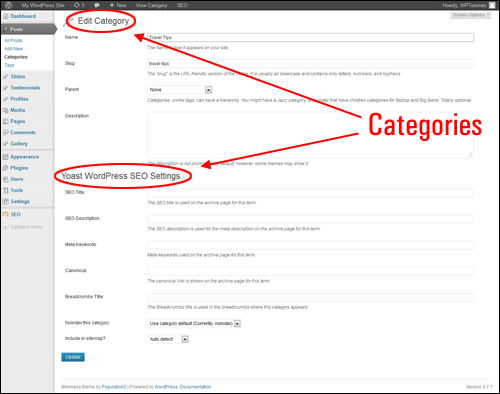 When configuring category and tag archives, we recommend choosing not to index these pages, as this will enable search engines to give more importance to areas like your post titles. In SEO terms, “nofollow” is used to prevent search engines from diluting your page strength on links that do not deserve the “link juice” (another SEO term that refers to the quality of your web site’s link power). For example, there is no need for your login and registration links to get page rank (i.e. you are not trying to get your site to rank higher in the search engines for those pages, so why waste “link juice”?) It’s better to pass the juice to the other pages on your site that you DO want to rank higher in the search engines for. The Yoast SEO plugin helps to prevent useless links that appear on many or all of your site pages from diluting your page strength. 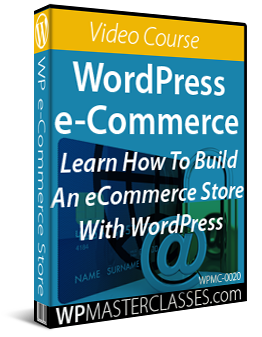 Additionally, many WordPress themes are designed in such a way that links point to the comment section, login link, WordPress.org site, etc. 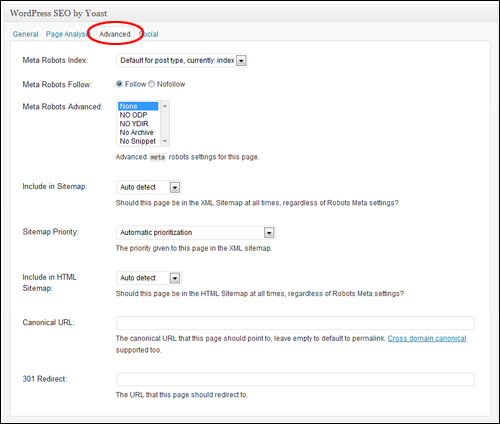 Yoast SEO automatically configures internal “nofollow” settings” to prevent search engines from following these links. Now that you understand the function of these elements, let’s take a look at how to configure your meta settings for this section. Note: Unless you specifically want to set up your title templates differently, just follow the recommended settings shown below. Remember too, that for maximum SEO benefit, you should manually enter a title and description for each item. Otherwise, the plugin will automatically insert a title and description to your posts and pages using the default settings as specified in this section. 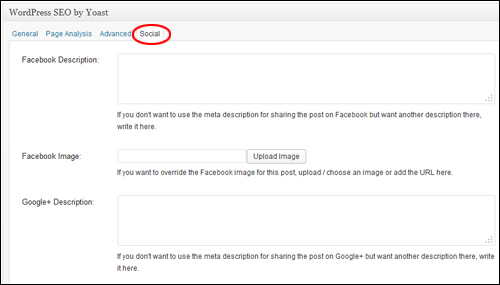 Meta Robots: Leave this box unchecked if you want search engines to index your posts. 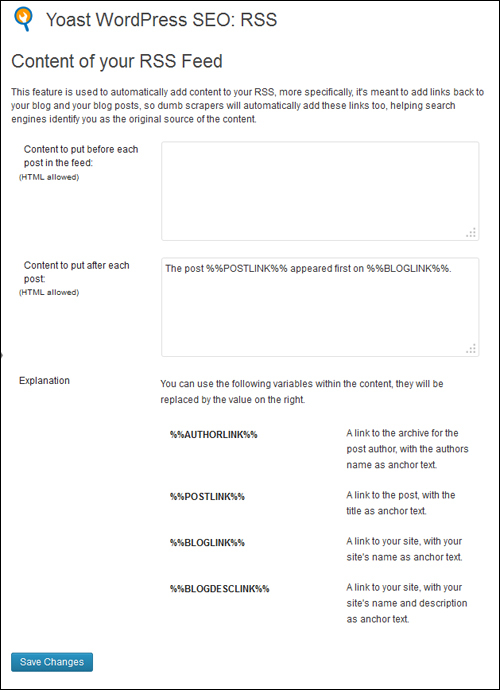 Authorship: Leave this box unchecked if you want search engines to display Google authorship information on your posts. Date in Snippet Preview: Check the box to display the date in your snippet previews, or leave it unchecked – it’s up to you. 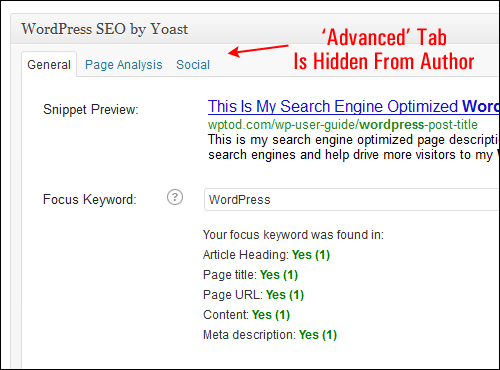 Yoast SEO Meta Box: Leave the box unchecked to display the Yoast SEO Meta Box below your post editor screen. 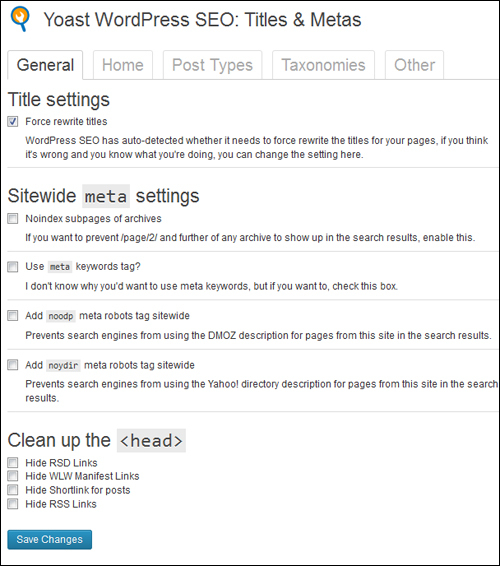 Meta Robots: Leave this box unchecked if you want search engines to index your pages. 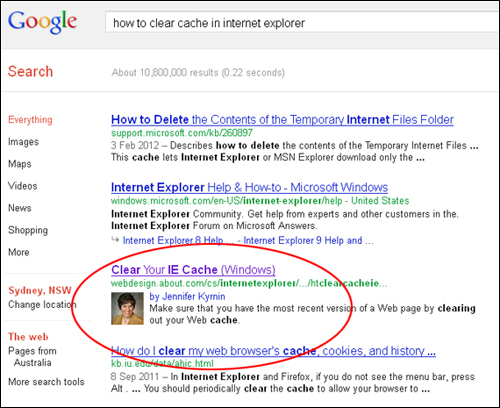 Authorship: Leave this box unchecked if you want search engines to display Google authorship information on your pages. 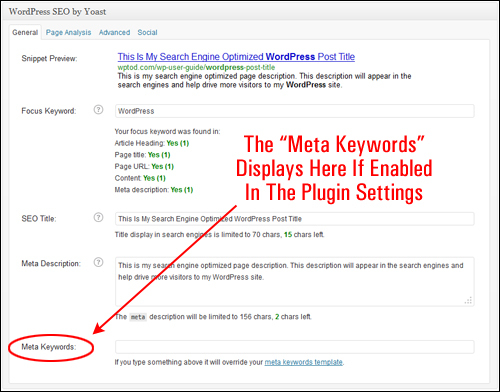 Yoast SEO Meta Box: Leave the box unchecked to display the Yoast SEO Meta Box below your page editor screen. Meta Robots: Check this box to prevent search engines from indexing your media files. Authorship: Leave this box unchecked if you want search engines to display Google authorship information. 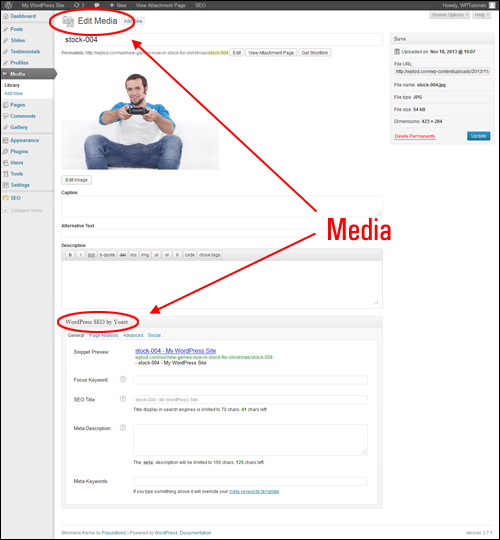 Yoast SEO Meta Box: Leave the box unchecked to display the Yoast SEO Meta Box below your media editor screen. If you don’t have any description for terms in your categories, tags, or custom taxonomies, then Yoast SEO will not add meta description data in archives for these terms. 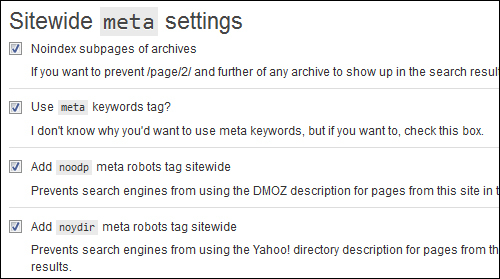 Meta Robots: Check this box to prevent search engines from indexing your categories. This way, search engines give more importance to your post titles than your categories. 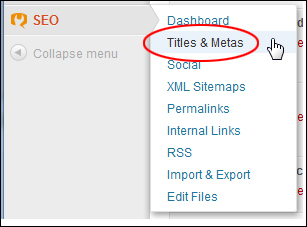 Yoast SEO Meta Box: Leave the box unchecked to display the Yoast SEO Meta Box below your Category screen. 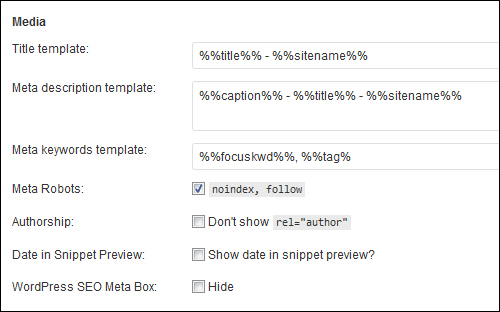 Meta Robots: Check this box to prevent search engines from indexing your tags. This way, search engines give more importance to your post titles than your tags. 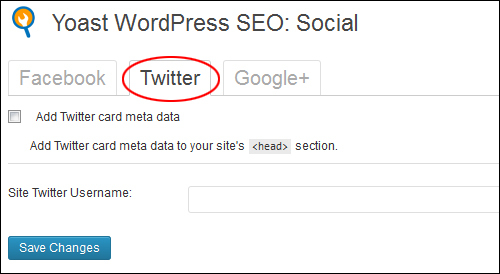 Yoast SEO Meta Box: Leave the box unchecked to display the Yoast SEO Meta Box below your Tags screen. Meta Robots: Check this box to prevent search engines from indexing your Format taxonomies. 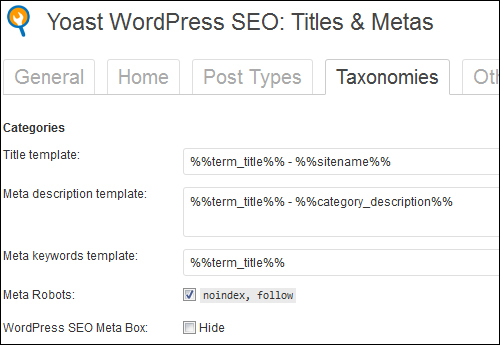 Yoast SEO Meta Box: Leave the box unchecked to display the Yoast SEO Meta Box for your format taxonomies. Title Template: %%name%%: %%sitename%% author. Meta description template: Author profile of %%name%% at %%sitename%%. If you’re running a one author blog, the author archive will always look exactly the same as your homepage. And even though you may not link to it, others might, to do you harm. Disabling them here will make sure any link to those archives will be 301 redirected to the homepage. 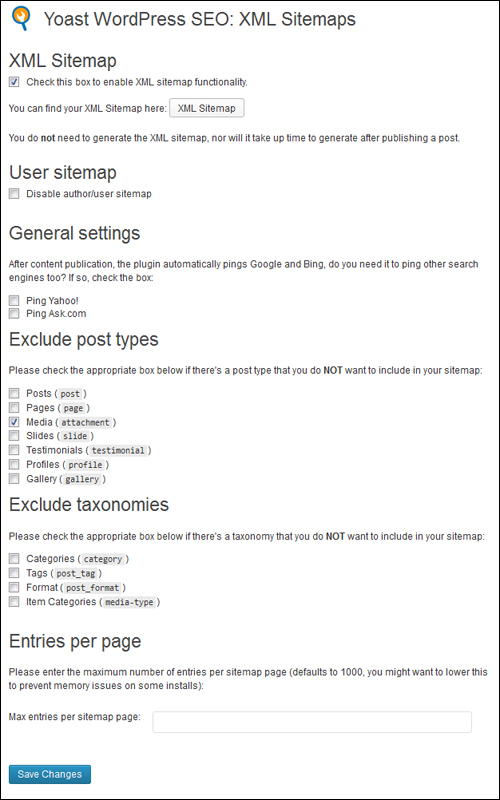 If you manage a single authored blog, use the recommended plugin settings as explained above for your author archives. 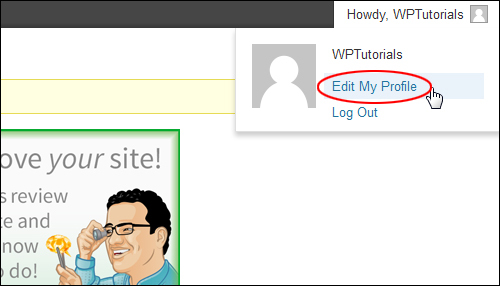 If you run a multi-authored WordPress site (i.e. many authors contribute to your site content), then we recommend that you leave the ‘Disable the author archives’ option unchecked. Meta Robots: Check this box (and the one below) to prevent search engines from indexing your date archive pages and avoid potential duplicate content penalties. For the date based archives, the same applies: they probably look a lot like your homepage, and could thus be seen as duplicate content. Disabling date-based archives is a matter for individual discretion. Unless you have a reason for leaving the ‘Disable the date-based archives’ option unchecked, we recommend following the plugin author’s recommendations. After configuring ‘Titles & Metas’ settings, the next step is to configure the plugin’s ‘Social’ settings. 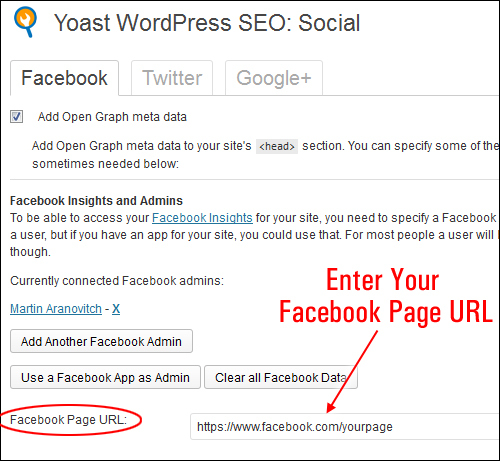 As well as being a very powerful SEO plugin, Yoast SEO also integrates your site with Facebook, Twitter, and the Google+ social media platforms. 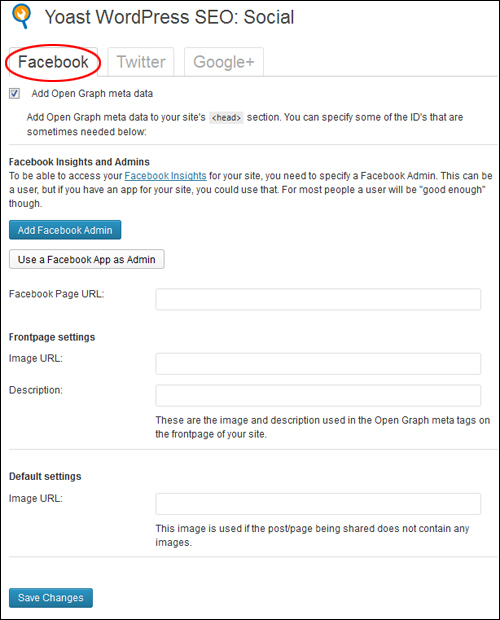 This section lets you add Facebook Open Graph meta data to your site’s <head> section. This will help prevent issues with Facebook thumbnails not showing, or a different title or description from displaying to Facebook users when your posts get shared on Facebook. 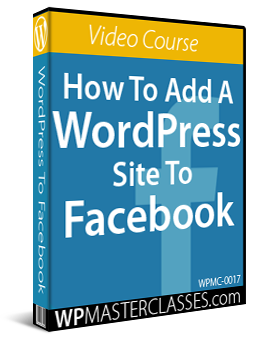 The next step is to associate your WordPress site with a Facebook Admin. You can choose a user profile as the ‘Admin’, or specify a Facebook app. (see link to Facebook App tutorial below). 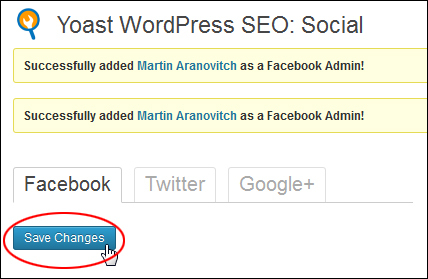 If you are already logged into Facebook, Yoast SEO will immediately add you as a Facebook Admin. 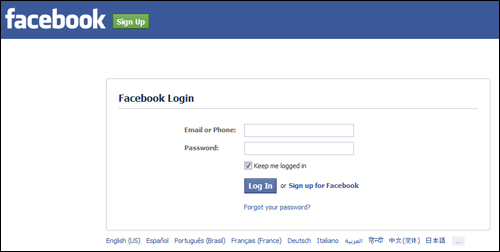 Log in to Facebook and the plugin will automatically add your details. 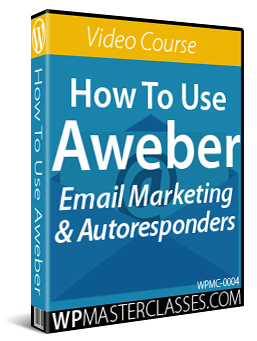 Image URL: Enter a thumbnail location for your home page (e.g. your logo). Description: Enter a description for your site. The image and description you enter here will be used when someone shares the home page of your site on Facebook. Image URL: Enter a default thumbnail image URL. This image can be the same as the one you have specified earlier, or any image that you want Facebook to use when content on your site that does not have a thumbnail or any other image associated with it gets posted to Facebook. Twitter Cards are similar to Facebook Status. 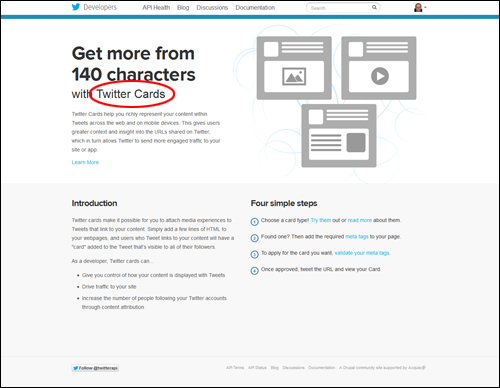 When you tweet a link to a site that has twitter cards enabled, it adds a preview with title, summary, and thumbnail of your page content. When a user clicks on the tweet, they will see this summary. 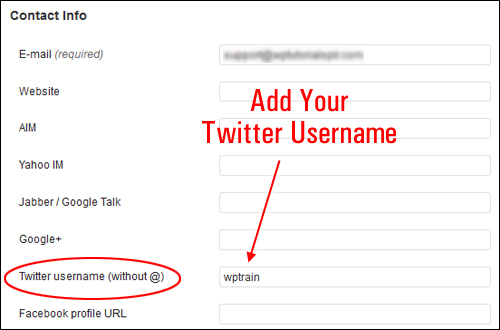 Twitter cards can help increase the number of people following your twitter account through content attribution. 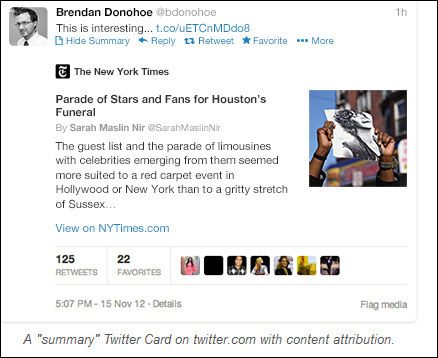 With twitter cards, the author gets credit from every tweet or retweet that mentions their post. 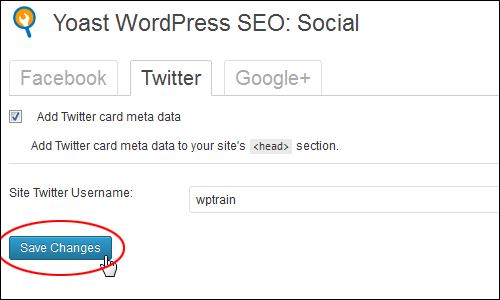 Yoast SEO provides an easy way to integrate Twitter cards on your site. Note: If your site allows multiple authors to contribute posts, make sure they know to enter their twitter details in their profile. This will allow each author to receive credit for his/her contribution. Author for homepage: Choose an author for your site’s home page from the drop down menu. Google Publisher Page: Enter your Google+ publisher page into this field, and then link it to your Google+ page’s “About” page. 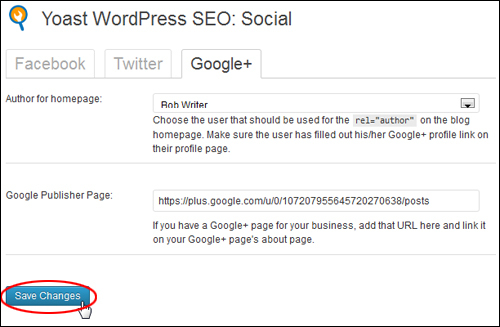 Note: The Yoast SEO plugin also adds a Google+ URL field to your profile page. 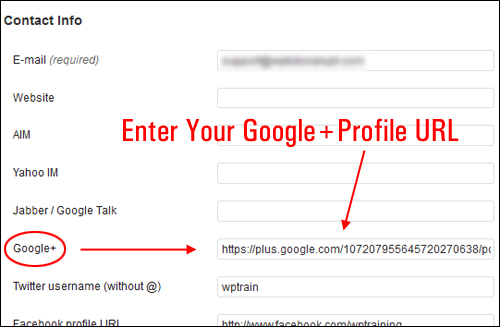 Make sure that you (and all other authors) add their Google+ URL into their profile pages and verify their authorship. 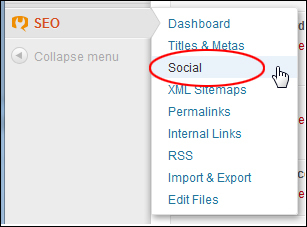 After configuring Social settings, the next step is to configure the plugin’s ‘XML Sitemap’ settings. 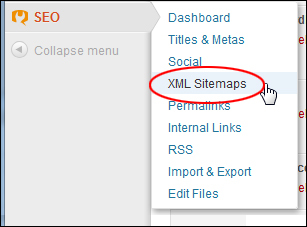 An XML (Extensible Markup Language) sitemap is different than an HTML site map. While a site map is useful for helping human readers find their way around your site, a sitemap is essential for getting your WordPress site indexed fast by the search engines and for telling search engines how to prioritize your content. 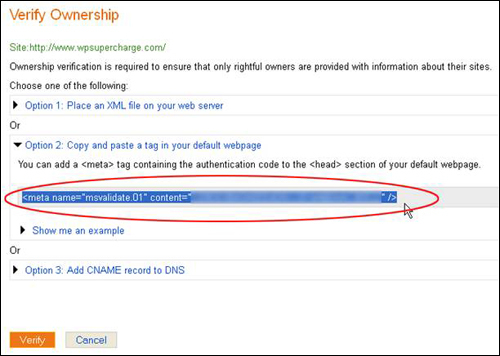 User sitemap: If you are running a single user site, then check this box to disable author/user sitemaps. General settings: Check the boxes to automatically notify search engines like Yahoo! and Ask.com in addition to Google and Bing. Exclude Post Types: Check any boxes in this section if there is a post type that you do not want to include in your sitemap. Exclude taxonomies: Check any boxes in this section if there are taxonomies that you do not want to include in your sitemap. Entries per page: Enter a maximum number of entries per sitemap page here. Yoast SEO creates an XML sitemap for your site and keeps it automatically updated. 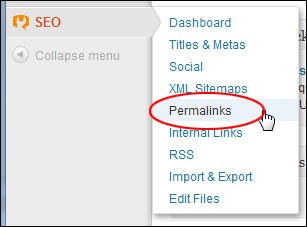 After configuring XML Sitemap settings, the next step is to configure the plugin’s ‘Permalinks’ settings. 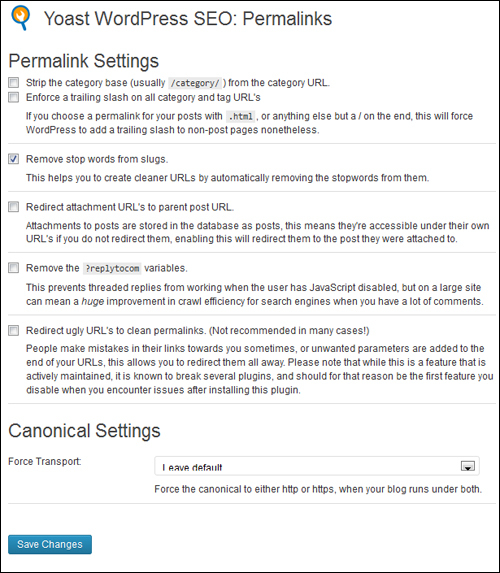 Don’t confuse the Permalink settings in the Yoast SEO plugin with the WordPress permalink configuration settings (Settings > Permalink). Yoast SEO optimizes the function of the built-in WordPress permalinks, but it does not allow you to create search engine friendly URLs. You should already have configured these. Note: This only affects your Category URLs, not your Post URLs. You can enable this option if you want, or leave it unchecked if you think that your category URLs and page URLs would conflict. This would happen if, for example, you choose to strip the category base, then have a category labelled “travel-tips” and create a page called “travel-tips” (i.e. both have the same name, and would, therefore, have the same URL). We recommend enabling this option, unless your posts end in .html. “Stop words” are words like a, and, to, etc. Generally we recommend leaving this option disabled. However, it’s up to you if you want to shorten your URLs by removing stop words. Note: Enabling this option does not change the slug for existing posts on your site, only new posts that you create. This is to prevent visitors from seeing ‘page not found’ errors when clicking on existing links. 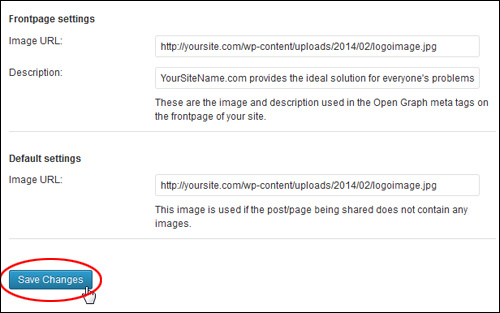 WordPress attaches images and other media to posts. All of those attachments, however, get their own URLs, which, in most cases, is quite unnecessary. 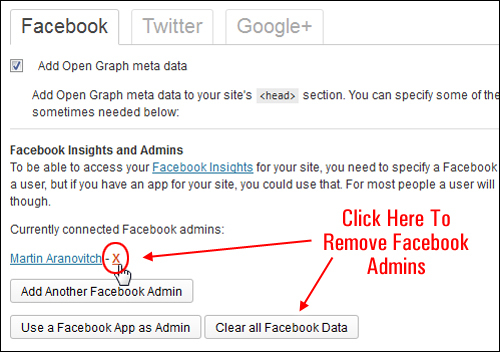 By enabling this option, all attachment page URLs will be redirected to the original post URL. People make mistakes in their links towards you sometimes, or unwanted parameters are added to the end of your URLs, this allows you to redirect them all away. Please note that while this is a feature that is actively maintained, it is known to break several plugins, and should for that reason be the first feature you disable when you encounter issues after installing this plugin. By checking the ‘Redirect Ugly URLs’ box, you will be cleaning all “ugly” URLs pointing to your site by turning them into clean permalinks. Most users don’t need to use this option. Other sites are linking to your short URL, or other ugly URLs (e.g. Feedburner links). If so, then it’s good to keep those links clean. 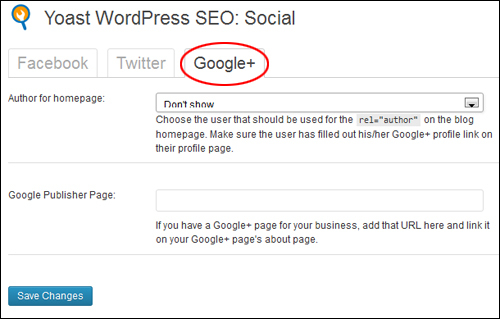 You want to use this option, but you are also using Google Site Search on your WordPress site. This can add other parameters that you do not want to clean. 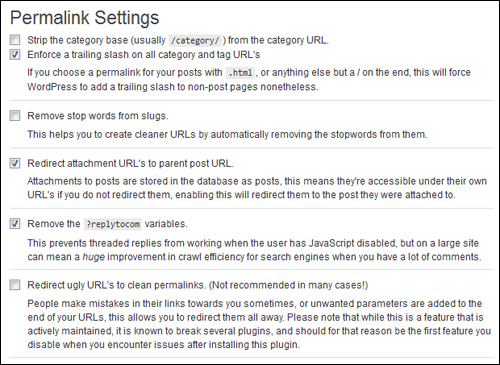 If so, then check the box to prevent cleaning out Google Site Search URLs in the ‘Clean Permalink Settings’ section. 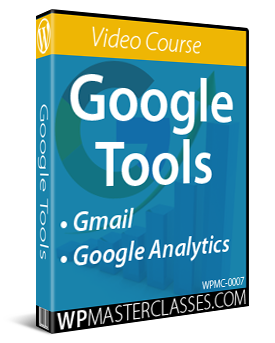 You want to use this option, but you are also using Google Analytics to track specific campaigns. 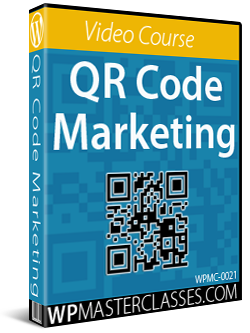 This requires adding tracking variables to the end of your URL. If so, you will want to prevent cleaning out your Google Analytics Campaign Parameters in the ‘Clean Permalink Settings’ section. You want to use this option, but you are also using extra variables in links that you do not want cleaned from your URLs. If so, then enter those variables (comma-separated) into the ‘Other variables not to clean’ field. Canonical settings can force the web site to be served normally over http, or, over https if you have an SSL certificate.We recommend leaving the default settings in this section, unless you know what you are doing. 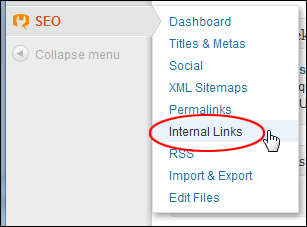 After configuring Permalinks settings, the next step is to configure the plugin’s ‘Internal Links’ settings. 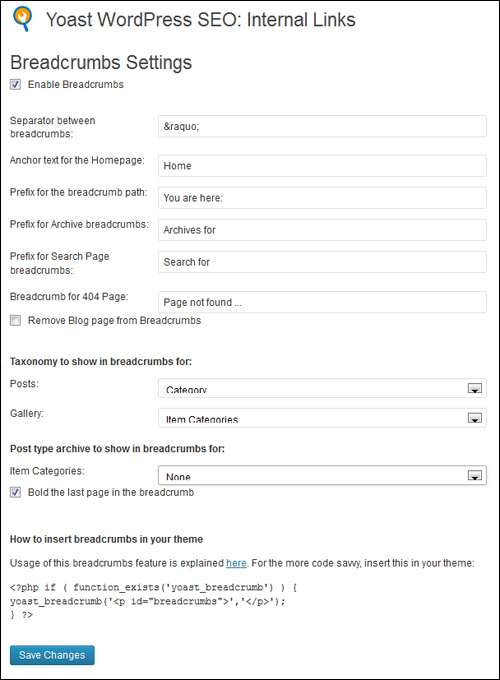 Many WordPress themes now come with built-in ‘breadcrumb’ settings, allowing to set up breadcrumbs in various locations and areas of your site (e.g. before or after main content sections), and also choose from a variety of styles and designs. 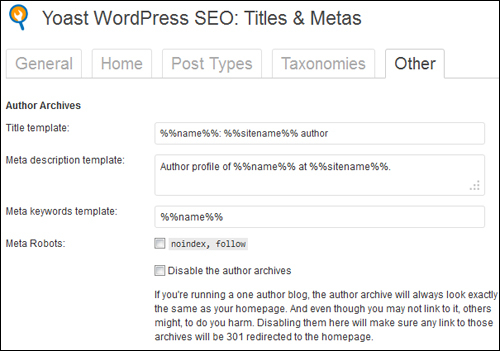 The Yoast SEO plugin allows you to add and configure breadcrumbs for your WordPress site. 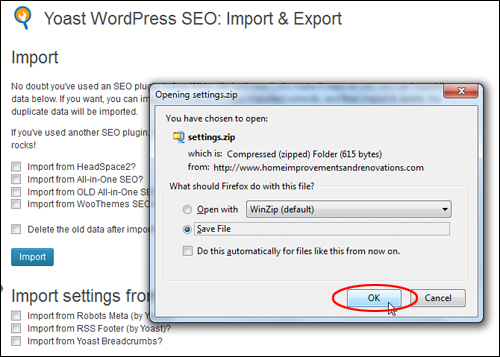 Adding breadcrumbs to your site using Yoast SEO requires editing code in your template files. We recommend, therefore, skipping this section, unless, of course, you want to add breadcrumbs to your site and are comfortable editing php code. For the sake of completeness, we will go through the process of configuring this section of the plugin in this tutorial. For more information about how and where to edit code to make the breadcrumbs work, however, please see the plugin website here: Yoast SEO Breadcrumbs. Enable Breadcrumbs by selecting the check box. Anchor text for the Homepage: Choose something like “Home”. Prefix for Archive breadcrumbs: In our example, we use “Archives for”. When someone visits the archives page, it will show up as “Archives for December 2013”, or whatever date the post has been archived under. Prefix for Search page breadcrumbs: This works in a similar way as the Archives breadcrumbs above. Visitors will see “Search for keyword”. Breadcrumb for 404 page: In our example, we have used “Page not found …”. 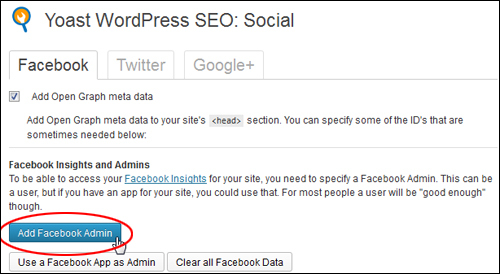 Remove Blog page from Breadcrumbs – If you are using WordPress as a CMS with a separate blog section, you have the option to remove the Blog Page from your breadcrumbs. 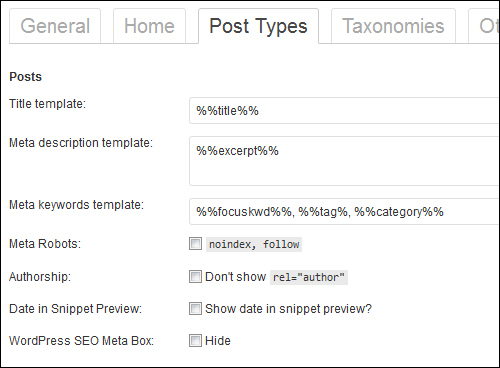 Taxonomy to show in breadcrumbs for: Yoast SEO gives you an option to select how you want to categorize your ‘Posts’ (e.g. by categories or tags), and your Gallery (e.g. gallery categories). Depending on what other applications you have running, you may see additional custom taxonomies and menu options displayed in this section (e.g. listing categories, event tags, etc.). Configure this section according to your own needs and preferences. Post type archive to show in breadcrumbs for: Depending on what other applications you have running, you may see additional custom post types and menu options displayed in this section (e.g. listings, events, etc.). Configure this section according to your own needs and preferences. You also have an option to Bold the last page in the breadcrumb. 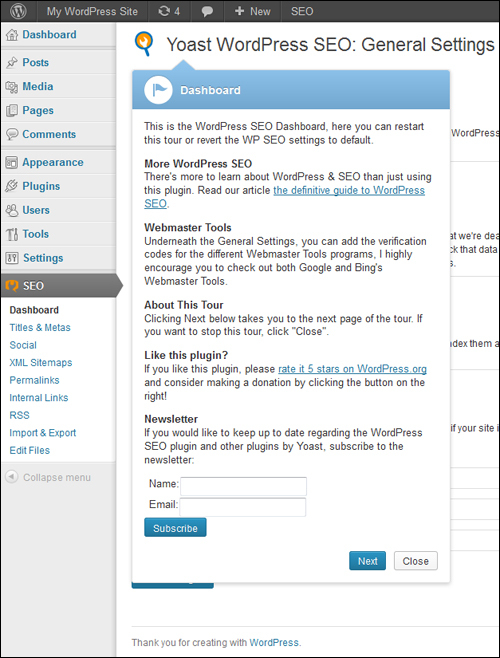 The plugin also provides links to advance usage instructions for adding code to your templates. After configuring Internal Link settings, the next step is to configure the plugin’s ‘RSS’ settings. This section allows you to control the content of your RSS Feed and add backlinks to your own site in your feed content. This is useful, because there are a lot of content scraping software scripts online that steal your content using your site’s feeds. By adding a link back to your site with every post, not only will you get backlinks from scraped content, but search engines like Google and others will know that you are the original source of your content. %%AUTHORLINK%% – This adds a link to the archive for the post author with the authors name as anchor text. %%POSTLINK%% – This adds a link to the post with the title as anchor text. %%BLOGLINK%% – This adds a link to your site with your site’s name as anchor text. %%BLOGDESCLINK%% – This adds a link to your site with your site’s name and description as anchor text. Adding a hyperlinked text in your RSS feeds will help drive more traffic to your site from visitors and search engines, and also help give your content proper attribution if your feed gets displayed on other sites. Congratulations! You have finished configuring the Yoast SEO plugin. The next sections of the plugin allow you to perform administrative functions, such as importing and exporting data, and editing files. 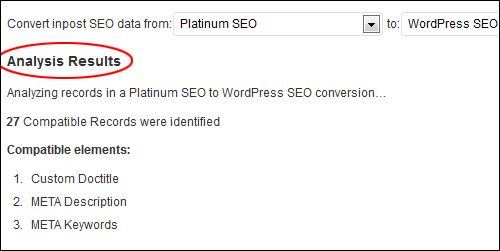 If you have been using another WordPress SEO plugin (e.g. All-In-One SEO) prior to discovering Yoast SEO, then we recommend that you consider importing all of the existing SEO data from your previous SEO plugin into Yoast SEO. Yoast SEO has a built-in importing facility that allows you to easily import your existing metadata (post titles, descriptions, tags, etc …) from previous SEO plugins, and migrate this information to Yoast SEO. 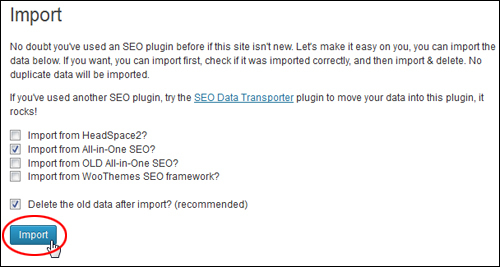 If you are using am SEO plugin that is not on the ‘Import’ list, then install the SEO Data Transporter plugin to move your data into Yoast SEO. 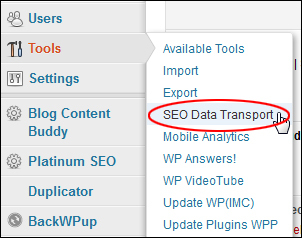 If you have been using another SEO plugin (like Platinum SEO) or a theme that has its own built in SEO custom settings (like Genesis or Thesis), the SEO Data Transporter plugin allows you to easily move your data from other platforms into Yoast SEO. 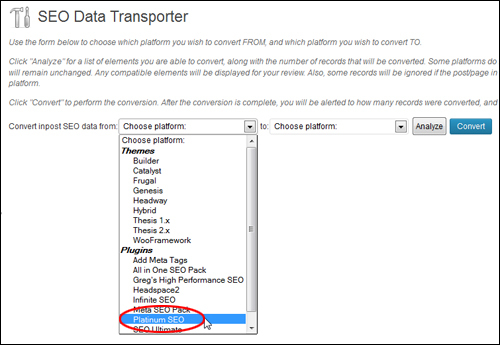 This brings you to the SEO Data Transporter page. Tip: Once the conversion has successfully completed and the data has been migrated over to Yoast SEO, feel free to delete both the old SEO plugin and the SEO Data Transporter plugin from your site if these are no longer required. 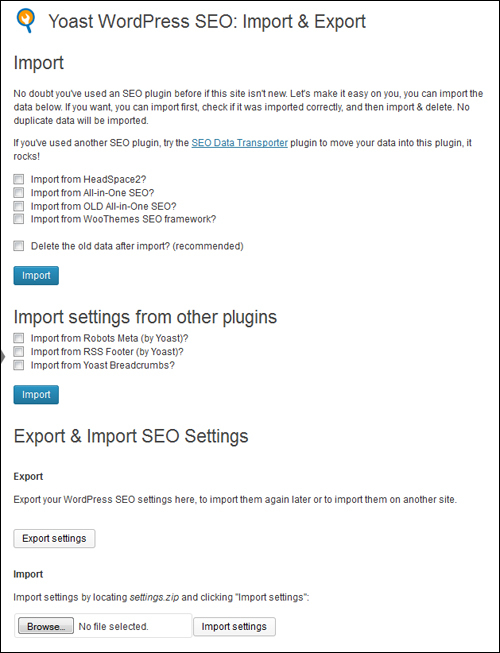 This section lets you export your Yoast SEO settings to your hard drive. 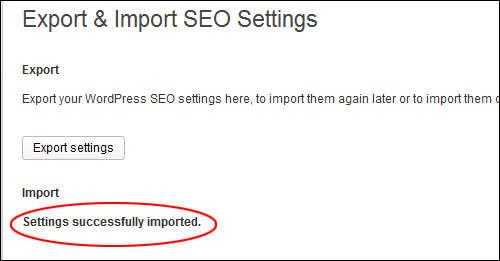 This way, if anything happens you can easily and quickly re-import your plugin settings back into your site. Additionally, you can use your exported settings file to instantly configure the Yoast SEO plugin settings on another site. The last item in the plugin menu is the ‘Edit Files’ section. 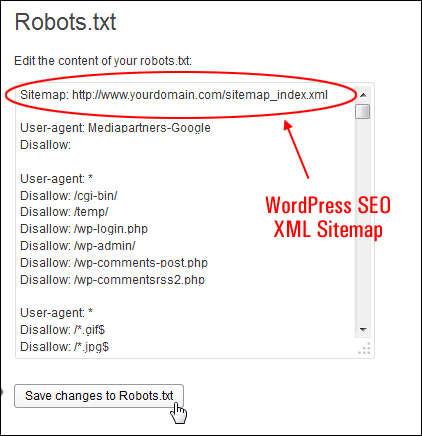 Tip: You can add a link to the sitemap file created by Google XML Sitemap Generator or the sitemap file created by Yoast SEO plugin to your robots.txt file using the editor. 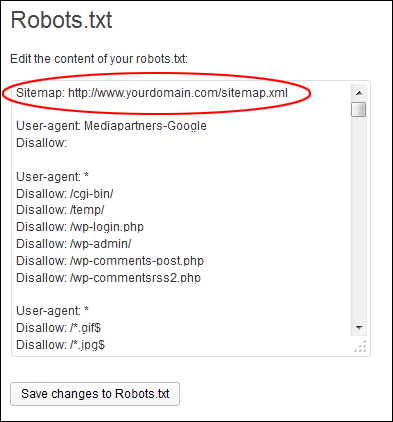 To change sitemaps, just paste the URL of the sitemap you want to use into the robots.txt file editor and click the Save changes to Robots.txt button. Important: Always back up your files before making any changes. If you are not sure about what you are doing, ask a professional to help you. If you have completed all of the previous tutorials for this module, then your Yoast SEO plugin should be fully configured. The next step is to learn how to use the Yoast SEO plugin to improve your search engine results. 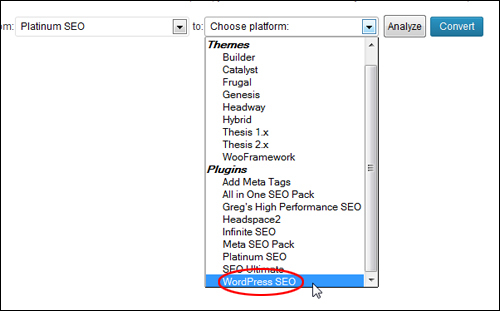 The previous sections of this tutorial show you how to configure the Yoast SEO plugin. In this section, you will learn how to use it. Simply installing and setting up the Yoast SEO plugin is not enough. In order to maximize the SEO benefits of this powerful plugin, you also need to understand how to use it. If you don’t customize your titles, descriptions, etc …, the templates you set up in the plugin settings will make sure that your content is still optimized for search engines. Writing your own titles and descriptions, however, can help to improve your site’s performance in terms of getting people who find your site in search engine listings to click through to your website. If you don’t use the meta description, the search engine will find the keyword searched for in your document, and automatically pick a string around that, which gives you a bolded word or two in the results page. 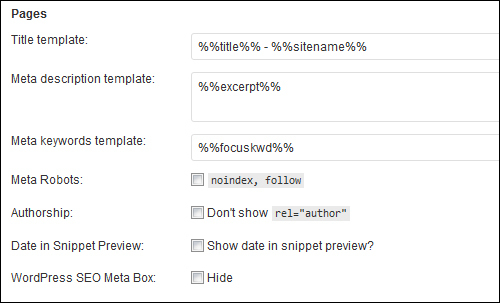 Auto generating a snippet is a “shortcut”, and there are no real shortcuts in (WordPress) SEO (none that work anyway). It is best, therefore, to develop the habit of manually generating titles and descriptions for all of your WordPress blog posts and pages. When you do this, keep in mind that you are trying to “sell” visitors into clicking through to your site, so the better you become at writing compelling copy, the better your titles and descriptions will convert “search viewers” into “web visitors”. Below your content editor screens (posts, pages, categories, tags, media, etc.) 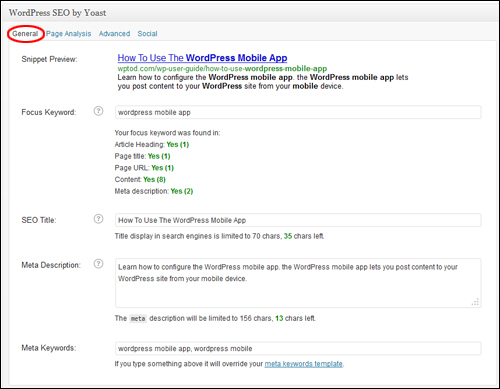 you will see the Yoast SEO Meta Box. General – This section lets you configure your SEO meta data. Page Analysis – This section offers recommendations for improving your content SEO. Advanced – This section lets you specify individual settings for indexing, breadcrumbs, sitemaps and redirections. As mentioned previously, it’s recommended that you write the title and meta description for each post and page on your site to maximize the benefit of this powerful plugin, rather than letting the plugin auto-generate this content for you. This section will dynamically change as you enter or edit information into the fields listed below, so you can see exactly how your item will display in Google’s search engine results. Make sure you select a focus keyword, so you can get an analysis on how strong your page is for that keyword. Depending on your strategy, you may not want the post title that your visitors see and the post title that search engines see to be the same. You can create a different SEO title in this section. You should write a custom meta description every time, because the excerpt generator will only select the first paragraph of your content, which might not be the most important, compelling or ideal portion of your content to “sell” to your visitors. 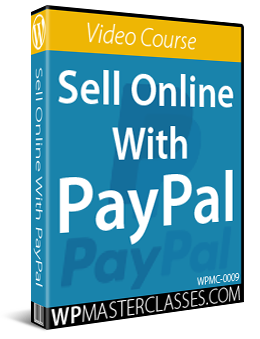 What you enter here is what will show in your search engine listings. We recommend that you stick to the 156 character maximum, since this is all that search engines like Google display in their results listing, and make it interesting or compelling enough for visitors to want to click on and come to your site. Enter your primary keyword first in this section, followed by 3-4 more related keywords, separated by commas. 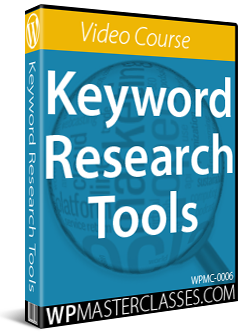 Use keywords that appear in your content. Entries tagged with green are good to go and need no further improvement. Entries tagged with yellow are good, but need some work. Entries tagged with red need immediate attention. Follow the recommendations beside each entry to better optimize your content. Note: The analyses and recommendations in this section are only suggested guidelines for improvement. Don’t go overboard trying to create ‘perfectly optimized’ content, as this is completely unnecessary and can waste a lot of your valuable time. Set Meta Robots Index to “Index”. Leave other fields blank unless you know what you are doing. Note: for pages like product pages, about us and other pages that you want search engines to index, use the same settings as the ones used for configuring your home page. Update/publish your post(s) (if necessary). 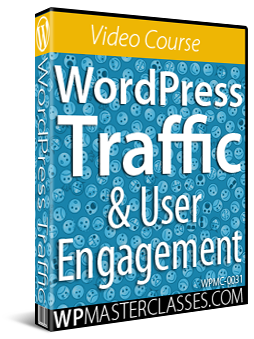 As you can see, the Yoast SEO plugin a powerful WordPress plugin that allows you to have an amazing degree of control over your site’s SEO. We strongly recommend installing and using this plugin to optimize your WordPress site for search engines and improve your traffic. Congratulations! 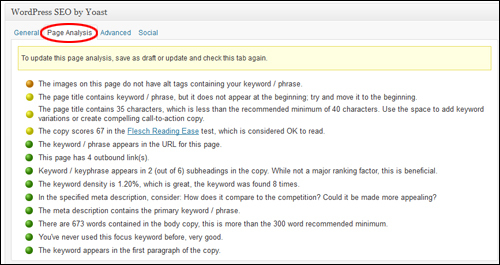 Now you know how to configure and use the Yoast SEO plugin.